Nascar directed shills on this board? Discussion in 'NASCAR chat' started by Madman88, Apr 14, 2019 at 10:00 AM. So much more literate than I imagined. I'm convinced a few accounts in this board are controlled by Nascar in an attempt to keep opinions and topics they don't like from going unchecked and to be drowned out if possible. LOL. I think it's funny how many NASCAR fans love conspiracy theories, and seem to find them just about everywhere. I mean. it's not like NASCAR fans are the *only* ones, but fans of this sport are among the quickest to spot conspiracies when the rest of us don't, IMO. If I Google, well, just about anything, what comes up first is sites and topics that I've shown an interest in before. Talk about conspiracy theories... geez Louise it's like the Goggle Machine has artificial intelligence or something.. In another NASCAR forum I follow, Mike Joy posts now and then and under his own name. If someone had a question for him, they would start a message saying "Ping Mike Joy" and he would usually chime in and answer whatever question the OP had. I haven't been over there in a little while so I don't know if he's still doing it or not. Next thing you know, they'll have the internet on computers. LewTheShoe and Greg like this. Search results go by visits.. the most popular sites are at the top. 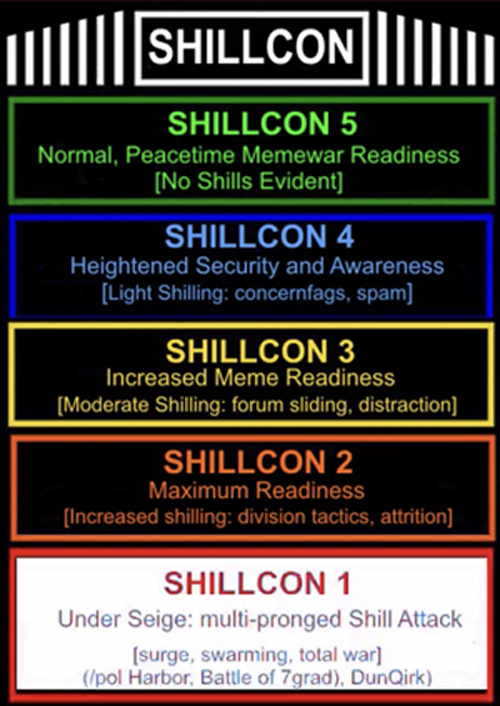 Wat the hell is a shill? An accomplice/worker who acts as an enthusiastic customer to entice or encourage others. Think of it like this --- a carnival side show. The owner hires someone to stand in the crowd and say positive things about the show. As in "oh, it was a fantastic show" -- "you really need to go in and see it". They may get part of the gate as pay. AuzGrams, Charlie Spencer, lisa and 1 other person like this. AuzGrams, Charlie Spencer, AdoubleU24 and 3 others like this. The team/organization absolutely had “moles”, or “plants” posting on them as a counter to the negative spin. If casinos can have "plants" at poker tables to start games, I wouldn't put it past some nascar exec wackjob to signup and try to control the narrative in his spare time. lol. Good example. What I don't get are those who think those who are reporting the racing news think that somehow these people on radio, TV, and at the track are going to hammer the sport. Go around hammering where you work to whomever will listen and see how that works for ya. If I remember correctly, didn't he say that some of his inside info made it onto Reddit from here and his sources are worried that they may get into hot water. So he's keeping it more to himself. Historically most of the things I'm involved with, or am told about I keep to myself, mostly because why wouldn't I? But if there are rumors or other anecdotal things that I hear that don't directly affect the things I'm involved with, I have no problem discussing what I've heard. The two biggest problems I'd have with discussing the things I'm directly involved in are 1) not only is it a betrayal of trust, but it's a betrayal of trust for no real good reason other than "hey this message board guy knows things!!!!" which I couldn't care less about, so why risk anything. But also 2) there are a lot of things that happen in NASCAR that defy layman logic...A LOT of things. So when I post something about a decision made that just doesn't make sense, or defies logic (as many do) it's way too tiring having to defend it to people who hear it and think I'm full of it. If I were in most people's shoes, on an anonymous message board, I would think I'm full of it too. But I know it's real because I was there, and it didn't make sense then either, however seeing is believing. So that sometimes gets tiring. It would be like having to defend a side in court without being allowed to introduce evidence that would immediately end the case. To a previous post, yeah I've known Kurt personally for a very long time, but I've never been his PR guy (I don't do PR). As for this thread, there are two things I'd bet money on based on the things I know. 1) There are definitely people in NASCAR who monitor what's being said about NASCAR on the internet (social media, message boards, comments, etc). Most big, successful businesses do that. 2) They are definitely not creating aliases and defending NASCAR or trying to sway opinion (especially here...no offense to any of us). I think their intentions are a bit more altruistic in terms of keeping a finger on the pulse of what fans are saying/talking about, and then putting that "research" into the soup when it comes time to make decisions. Blaze, DUN24, LewTheShoe and 5 others like this. This is why independent parties are always the most truthful resource. Employees associated with the profitability of the company are typically shills for said company, except behind closed doors or if they're disgruntled and lashing out. that would be nice if it was so. There are independent parties who do fake news so that isn't always the most trustful resource every time if ya know what I mean. Social media is full of em. Okay let me rephrase, a credible 3rd party. More often than not. If you Google NASCAR forum is the first site that comes up.. actually it's the first two.. so I'm going to have to disagree. I doubt it makes a big difference and I'm not sure if there are members undercover for NASCAR but they know that we exist for sure. This morning I wondered how many people actually search for forums these days. Don't most people participating in discussions (esp. casual fans) stay within their Facebook reservations, reddit corrals, and other social media fenced playgrounds? We may hit the top of searches for 'NASCAR forums', but what percentage of North American web users search for that string? Big fish, minuscule pond? Who knows? You're probably right. I just thought I'd point it out. Who are the NASCAR directed shill accounts? I thought you were one no? Yep, NASCAR wants me to chat about attendance and the ratings. They tell me to do that every Monday after the race. So far, they love me! This site is a little more well known than you think. Let's not forget that Jeff Gluck has popped up in here before. Someone who writes for Speed51 full-time was discovered on this board too. "NASCAR directed shills" is conspiracy theory stuff, but this forum does not fly under the radar unnoticed. AuzGrams, SlicedBread22 and Turtle84 like this. I just wished Nascar did things the old fashion way like thei used too. It was just five years ago when they were using a Golden Retriever to bark out freindly easy to translate Nascar positive only posting points, those were the best days of my life. About 3 years they replaced 'Buddy' with the 'Ruff Gentleman'. He was a rougher more intimdating and uncompromising breed. I knew l had better post whatever he barked. I couldn't wait for his replacement. 'New Dog' isnt from around here. It took me three months to figure out he only barks in morris code. Nascar thought they was smart. They just made it easier for the hackers that now only need a morris code template for code breaking. They are just a few that can translate southern redneck nascar dog dialects. mack and aunty dive like this. NASCARs problem is that they ever catered to the fans to begin with. Now they're stuck in an endless loop of corrections when really there is no problem to begin with. Turtle84 and aunty dive like this. Darrell Waltrip decided to retire and stay here with us. NASCAR does a better job of listening to fans than what people give credit for, at least the past few years. So, that is at the root of the debate -- aside from opinions on quality of racing, qualifying, venue attraction, asses in the seats, asses on the couch, etc. Is NASCAR listening more to Fans, Sponsors, TV Networks, Voices in their heads, whispering Little birds...? The premise of this thread suggests that positive comments are from NASCAR, therefore all acceptable comments should be negative. Since I watch almost every race there are must be things about NASCAR I like. LewTheShoe, Charlie Spencer, mack and 2 others like this. We'll, would you like digger back to help you and be your personal Nascar emotional support critter? That's part of the problem though.. the fans are so conflicting its sickening. When they listen to fans they just anger the rest. I think they are mainly concentrated on the racing product and modernizing their race tracks. That alone is controversial enough. Nascar does get blamed for lame TV racing coverage, too many commercials, the weather, drivers too mamby panby, and just existing for the sake of existing..
Mike Joy using the internet is scary. Joy used to be on AOL in the late 90s when I was on there, well before Fox came into the picture. I'd correspond with him about every 3 months or so until I quit using AOL. Joy's twitter account is pretty good, sometimes he takes a pic of the Fox info board that has 10, 20 lap times on it. Then ask someone who isn't a fan of any particular driver, who is a fan of racing itself. Team Penske and Turtle84 like this. dpkimmel2001, Charlie Spencer, Greg and 1 other person like this. Some people are little tetchy about the way they go about sayings. rd45usa and aunty dive like this. Like "shillicon valley"? That's where them reely smart peeps lives at. rd45usa, AuzGrams and Greg like this.